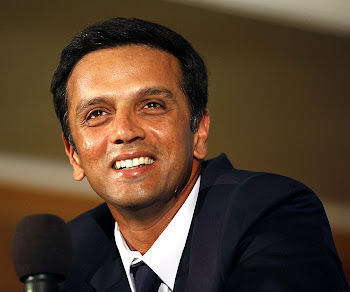 Rahul Dravid: 177 in a day by Rahul Dravid : he was completely different! 177 in a day by Rahul Dravid : he was completely different! I don't know where to start from- 11k mark or 177 in a day or terrible strike rate or staying till the end right from the 4th over. Let's start with 32/4 (!). Not a score any team would like to live with, especially after electing to bat first on Indian wickets.Back in April 2008, team India was all out for 76 on the same wicket and today the history was almost being repeated.The swing bowling along with the in-cutters revealed the holes in batting technique of Gambhir, Shewag and Laxman. Sachin threw his wicket away cheaply to an incoming delivery, inviting the ball to go through his gap between bat and pad. It was just the 8th over in progress and team India was not even in position to play out a session. But one man who can be relied on in such situations- The Wall- started turning the tables on SriLankans. Yuvraj too was positive in his approach and these two started building a quick and solid partnership. Rahul Dravid played the in-swinging deliveries beautifully, hitting a few of them to the boundary.On the other end, Yuvraj was looking a bit shaky (lack of patience), but escaped luckily on certain risky shots. After the lunch, the pair continued to trouble Sri Lankans with boundaries.But finally Yuvraj ran out of patience and scooped a ball to the short cover off Murali. "I knew we needed a partnership.I had that South African game [April 2008] at the back of my mind, where we were bowled out in 20 overs and the wicket became good later on. I knew that if we could get through to lunch, batting would get a lot easier. Yuvi [Yuvraj Singh] came and batted really well. He was very positive and played some good shots. We were able to put on a 100-run partnership and that set the platform for me and Mahi [MS Dhoni]. We showed character today to be able to fight back." The platform was perfectly built for MS Dhoni, who played a brilliant innings. 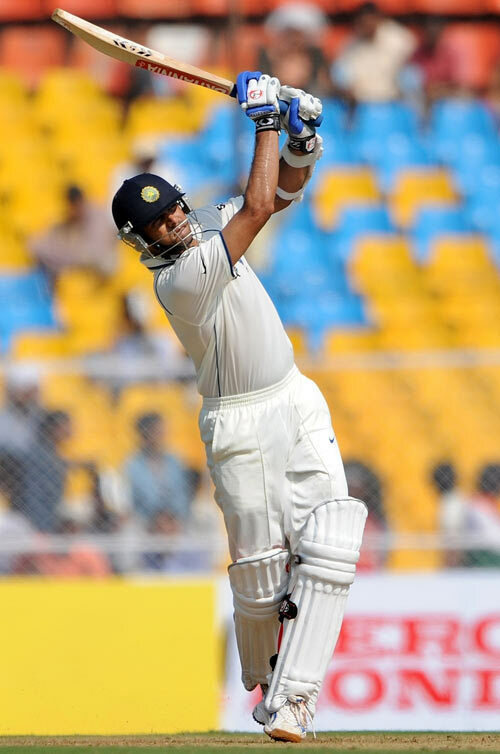 He kept the scoreboard ticking with singles and twos.On the other end, Rahul Dravid was on song.He was picking and timing the ball correctly, making life miserable for the fielders on boundaries.The pair added quick 64 before the tea break. Dravid completed his century and reacted in unexpected way. It was the first time out of 27 that he reacted a bit aggressively. Was it just a rush of blood? Or was it the proof that he is still capable of playing ODIs? Who knows. He played shots all over the ground, major chunk of which came off the mid-off region. Both Dravid and Dhoni made the lankans sweat for their wickets.Dhoni started to free his arms when he hit a typical dhoni six off Murali.Dravid went on to score 150 and quickly reached 160.Dhoni, on the other hand, succeeded in scoring his 2nd century. At his indivisual score of 110, Dhoni nicked one to the keeper, just 2 overs before the stumps. India managed to survive those 12 balls without throwing any more wickets. 1.Fifth test player to cross 11000 runs mark. 2.Record no. (78) of 100+ partnerships. You made my (our) day Rahul! You can watch the highlights of Day 1 here. A brilliant write-up. I too am fan of Rahul Dravid. I was expecting him to score a century in second innings too. But, alas, it was not to be due to a dubious lbw decision. Anyway, I am very much happy for Rahul that he has proved consistently time and again. He is an unsung hero. I still weep at the ten times he got out in 90s. He would have had 38 centuries by now!!!! 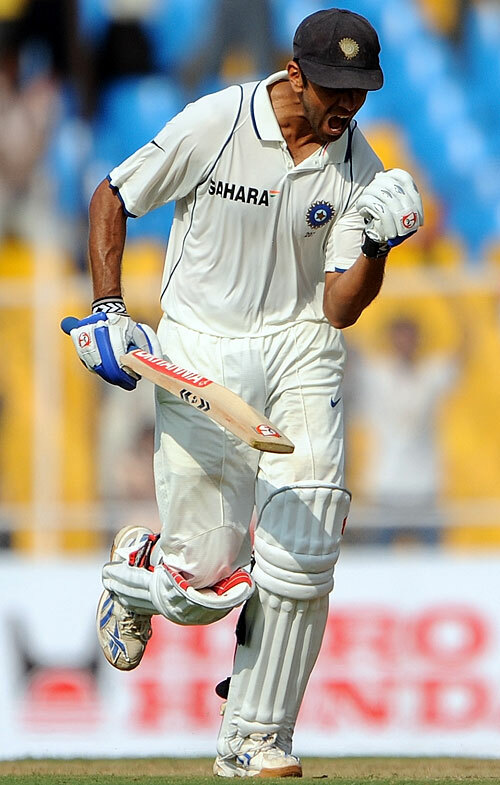 He scored a hundred in the second test and hope to make it three in a row at Mumbai. @Ram, Such decisions are part of the game.We have to accept them as a "gentlemean". Typical Rahul Dravid innings. Saviour for the team when most of the celebrated batters are gone cheaply. Request an analysis of each of those 28 centuries in terms of what position the team was when he came in to bat. I will come up with the analysis of his centuries soon.